[Tyson’s] family went with creating rather than buying Christmas presents last month, which gave him the opportunity to build some electronic fireflies for gifts. He drew inspiration from a similar firefly project we featured last year, but expanded on the original model by designing dedicated PCBs and housings for each of his firefly pieces. Although he’d settled on using ATTiny85’s for this project, [Tyson] was fresh out of through-hole versions. He decided to skip the prototyping phase and go right for fabrication, cranking up the laser-jet printer for some toner-transfer, which successfully produced 4 functioning boards (and 3 failures). The fireflies were [Tyson’s] first attempt at SMD soldering, and we’d have to say it’s a job well done; he reflowed each board with a cheap-o heatgun from Harbor Freight. [Karl Lunt] wrote in to share his LED firefly project. His goals for the project were to develop a low-power, low parts count module that can sense when it’s dark and then mimic the blinking patterns you’d associate with its biological namesake. We like his design which uses a coin cell battery holder as the chassis for the project. The ATtiny13 driving the hardware is held in place by the two power wires. This lets him flash new firmware by rotating the chip and plugging in a little adapter he build. The LED connection might look a bit peculiar to you. It has a resistor in parallel, which doesn’t satisfy the normal role of a current limiting resistor. That’s by design. [Karl] is driving the LED without any current limiting, which should be just fine with the 3V battery and short illumination time of the diode. The resistor comes into play when he uses the LED as a light sensor. 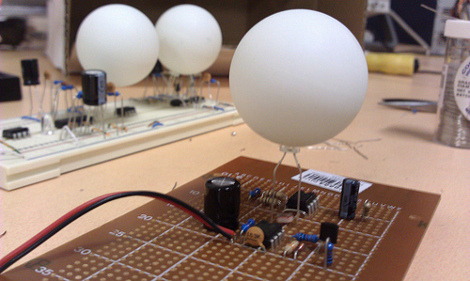 Past firefly projects included light dependent resistors to detect light and synchronize multiple units. [Karl] is foregoing the LDR, using the LED with a resistor in parallel to combat the capacitive qualities of the diode. As we mentioned, this senses ambient light, but we’d love to see an update that also uses the LED to synchronize a set of the devices. [Michael Ossman] wrote in to show off his newest project. He calls it the Firefly cap, which we think is something of a play on words. 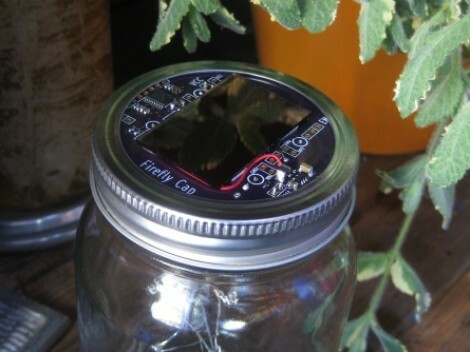 You can see that it serves as the cap of a Mason jar, but it also uses a supercap instead of a rechargeable battery. Posts about firelfly jars go way back. And [Michael] mentions that a similar firefly project was his first embedded project. The concept uses LEDs suspended in a jar. When a light detector senses the target level of darkness, the lights inside begin to twinkle like their insect namesakes. We like this design for two reasons. It’s aimed at collecting light in an indoor environment so you don’t have to worry about placing it in the sun. And it uses a super capacitor instead of a battery so this should truly keep going and going without wearing out the energy storage components. We also like the fact that although this is a Kickstarter project, everything you need to build your own is already available at the Github repository. [dev_dsp] wanted to try his hand at creating a purely analog implementation of multiple synchronizing fireflies powered by a single battery and built from off-the shelf, through-hole components on inexpensive protoboard. In theory, even your local Radio Shack should still carry all of this stuff. He was obviously inspired by [alex]’s fireflies that we’ve covered in the past, but he wanted to see how far it could be taken without the use of a microprocessor. In the end, [dev_dsp] relied on one crucial piece of digital ware, the ever-popular 555 timer IC, but he’s using analog discrete components to do the grunt work of adjusting the phase of each firefly by feeding a little extra current to the trigger capacitor whenever the flash of a nearby firefly is detected. After the jump, you’ll find schematics and a video demo of three ASync-Firefly modules in various stages of assembly playing with one another while [dev_dsp] discusses their operation. These aren’t terrorists, they’re electrical engineering students. 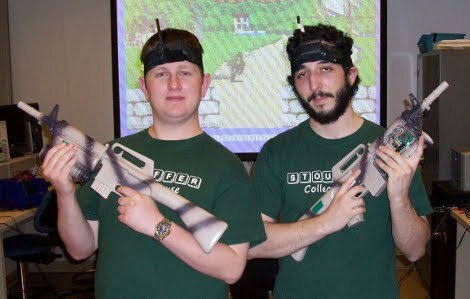 For their final project they developed a headband and rifle input system for the NES. The controllers send data to a laptop which then maps out the inputs to NES controller commands and sends them to an original NES console, no emulation here. The controllers in the headband and rifle are Firefly sensor network nodes. Originally, [Kevin] and [Evan] tried using accelerometers for motion information but found the data do be unreliable. After an upgrade to gyroscope modules the interface is much more responsive, as seen about 3:50 into the video after the break. We like seeing motion controller hacks and we appreciate the choice of a classic system (and lesser known game title). This really makes it a whole different game. [Alex] of tinkerlog created a set of 64 RGB fireflies that synchronize to blink all at once. We covered the kit earlier, but he has assembled a set of 64. Each firefly is independently controlled by an ATtiny13 that reads a phototransistor and lights up an RGB LED. The fireflies are programmed to blink a certain rate, but blink faster if they detect other blinks. After a few cycles, the fireflies begin to blink in unison. When the fireflies are arranged in different configurations, different patterns emerge. He is selling kits and has instructions for building your own. Videos of the fireflies after the jump. [sixerdoodle] sent us this nice firefly project that serves as an intro to charlieplexing. We’ve mentioned charlieplexing before, in our LED Life post and the Breath Controlled LED candles post. This project is quite simple and focues mainly on how to make a charlieplexed circuit work. The goal was to create a tiny firefly bottle with SMD LEDs and as few wires as possible. In the video, after the break, it is hard to tell just how small this thing is until we see the battery. There are clear directions and fantastic pictures detailing exactly how to set up a charlieplexed circuit with 6 LEDs.